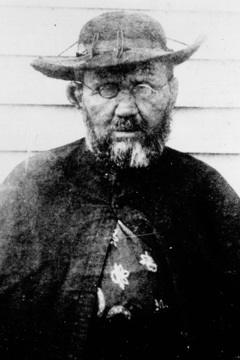 This photo released by the Damien Museum shows Father Damien De Veuster less than a month before he died in 1889. BRUSSELS, Belgium » The Dutch-speakers from Belgium's northern part elected priest Father Damien, who devoted his life to leprosy sufferers in Hawaii, as the "greatest Belgian," newspapers said yesterday. In this linguistically divided country, there was no common vote on the nation's greatest personality. The Francophone vote will take place Dec. 20. Father Damien is also among the top 10 choices there. In the poll of the 6 million Dutch-speaking Flemings, Father Damien beat the late medical scientist Paul Janssen and cyclist Eddy Merckx. Ten years ago, Pope John Paul came to Belgium to beatify Father Damien, a model for the late Polish pontiff. Damien was 23 when he arrived in Honolulu in 1864. Nine years later he went to the leprosy settlement of Kalaupapa on Molokai, answering a call for volunteers. Leprosy -- a deadly disease at the time -- creates ulcers over the body, deformations and the loss of fingers and toes. Leprosy patients often were banished to settlements like Kalaupapa. In Hawaii, Damien found his mission among the incurably sick -- nursing them, providing spiritual guidance, burying them, creating a sense of community. He built houses, a hospital, an orphanage and a church. Eleven years after his arrival, Damien contracted the disease himself. He died at 49. Father Damien won the poll with 51 percent. Janssen had 27 percent and Merckx finished with 22 percent.